One of the more important, but less appreciated, properties of a fired projectile is its time of flight. That means the time taken between shot exit and impact onto the target. This is normally written as 'tf' and for small arms, it is usually quoted in milliseconds, or at least decimal fractions of a second. However, if you upsize a bit, you may need to know that for a 16" Mark II Naval Gun, 'tf' is 1.5 minutes for a range of 38,000 yards. This time interval is not simple to calculate or to measure, even though the initial velocity and the distance involved are usually known. The task is complicated by the fact that we normally only know the initial velocity of the bullet and, as we are all aware, that velocity reduces steadily, but not uniformly, as the flight progresses. The majority of the ballistics-oriented computer programs that are around today do the calculations for values of 'tf' as a matter of course. They display such answers with an impressive number of decimal figures, as do some pamphlets put out by the various bullet and ammunition manufacturers. However, it pays for the shooter to remember that such people have a vested interest in making sure that any figures for their own products always look that little bit better than do those for their trade opponents. Caveat emptor! Shadow detectors are used in most of the small chronographs favoured by sporting shooters and have a good record at that job. The actual measurement of 'tf' would appear to be dead simple, but can contain a few snags, particularly around the fixing of the true start time - the exact shot exit time. It would seem relatively simple to fix the time that the shot first loses contact with the barrel. However, that is not necessarily true, since there are a lot of other events going on at around the same time and place. The shot exit detector must be able to look at all such occurrences and pick out just the bullet itself - no easy task. Things are usually much easier at the target end, provided that you are interested in just this one target - a metal plate, for instance, gives a precise and satisfying 'clang' on impact by a solid shot. However, even then, many complications can arise, particularly if you are also interested in a string of other targets downrange. Things can turn pretty complicated and the number of suitable detectors can become limited if you are really looking for any sort of precision. For a single shot kind of experiment, the audible 'clang' on a metal target is accompanied by a series of shock waves within the target itself. These can be detected, simply and easily, by a number of devices. Microphone-type detectors of this nature are, for instance, quite capable of distinguishing between the individual shots of a burst of fire from a machine-gun. 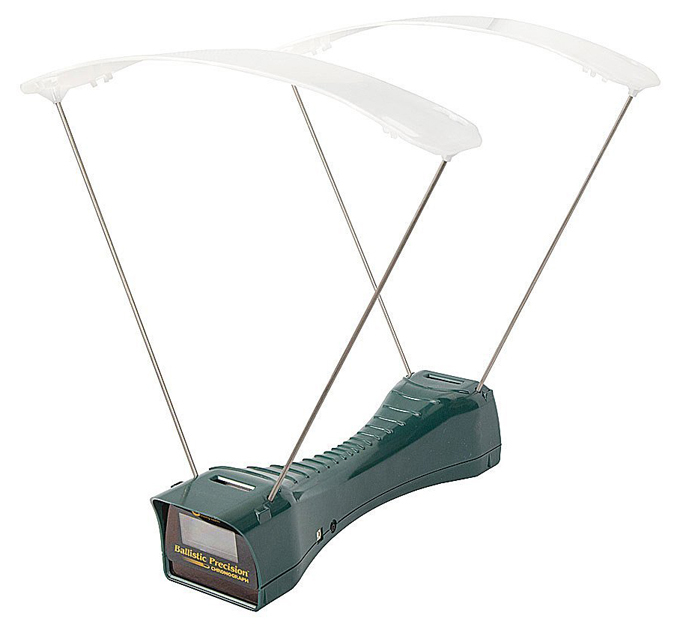 Shadow detectors are used in most of the small chronographs favoured by sporting shooters and have a good record at that job. One of their major advantages is that they do not interfere with the passing bullet in any physical manner and therefore can be readily used in strings. They can also be incorporated into experiments such as target shooting. This raises the concept of mounting such a detector just a few yards downrange - clear of the muzzle blast from the gun, of course - and then using that signal as shot exit. Such a number will always be a few milliseconds late, but the error will be small, consistent and easy to estimate. Overall, it is possible to start a timer with a signal from a muzzle detector and to stop it with one from a target detector - and there is your time of flight laid out for you. 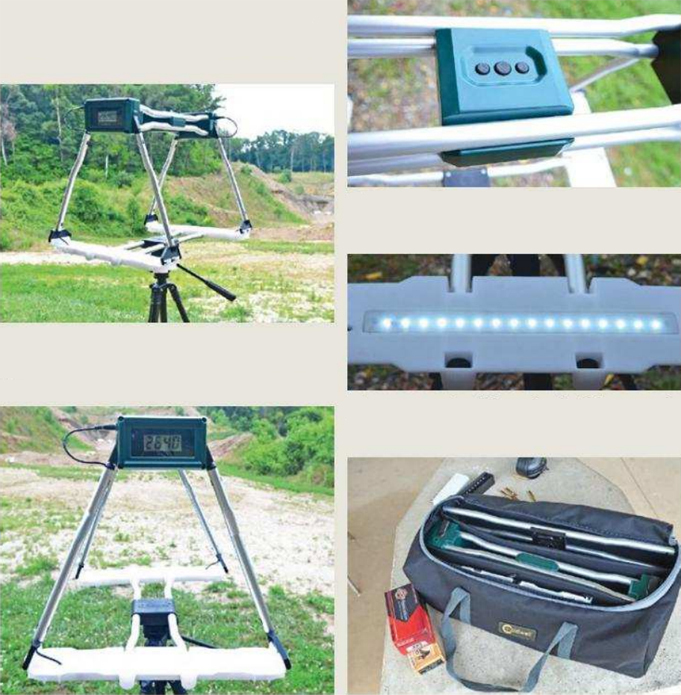 The Caldwell Ballistic Precision Chronograph Premium Kit is a must have for a variety of shooters from handloaders trying to optimise load data to archers and air gun enthusiasts. This chronograph will provide an accurate velocity reading from speeds of 5 to 9,999 fps and all within 0.25% accuracy. 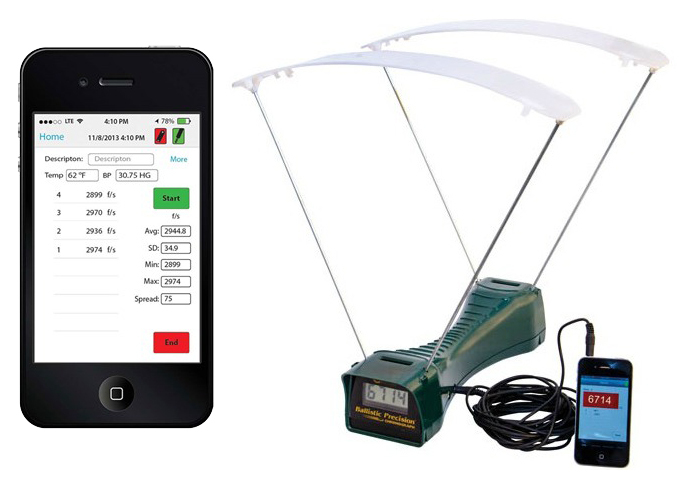 The kit includes a 15' audio jack cable which can be plugged into a Smartphone ortabletthat uses a free app called "Ballistic Chronometer" available for iOS or Android. This App will display the velocity of each shot on the screen and record it with other data identifying the current load and environmental conditions during the shooting sessions. Other data calculated by the App include average velocity, standard deviation, minimum velocity, maximum velocity and velocity spread for shot string. This data is stored and can easily be exported through email or SMS messaging, or simply stored for recall at a later date. The chronograph also remains simple to use, giving a readout of velocity in feet or meters per second on a large LCD screen. TOP LEFT : The new Caldwell Ballistic Precision G2 chronograph has an inverted system that's reported to increase the accuracy of its readings. BOTTOM LEFT : After each shot, information is sent wirelessly to your smartphone via Bluetooth. TOP RIGHT : With only three buttons to mess with, the G2 is very easy to use . MIDDLE LEFT : When you need a little extra light for accurate readings, LEDs can be activated. BOTTOM RIGHT : The G2 breaks down and stows easily inside the included bag. Sure, there are sexier accessories than chronographs, but none of them will tell you more about your gun and/or loads than a chrony will. Caldwell's newest chronograph is perhaps the niftiest of the bunch. The coolest things about the G2 are the fact that it runs off of a rechargeable lithium ion battery and ts Bluetooth capability. The G2 will pair with your smart-phone (iPhone or Android) and send information (velocity, weather conditions and other data) wirelessly to the Caldwell app after each shot The app is easy and intuitive to navigate. Its guts are calibrated to within .25% of the actual velocity of your rounds (or arrows if you're shooting a bow) thanks for a 48 MHz processor that offers greater accuracy than previous models. If the G2 looks weird, it's because the whole system has been flipped upside down. Caldwell claims that this—alone with the faster processor—make readings more accurate, especially in poor light. LED lights are built in to the sunscreens when you need a little more light, and the whole kit and caboodle sets up and stows easy because there are only four parts to mess with. I've used the G2 to meter four guns, ncluding a .45 and 9mm pistol, a .223 AR and the Ruger Takedown Lite. I've only gotten a few errors because I was shooting through the graph at extreme angles, but otherwise it's the easiest-to-use chrony I've ever had. Retail price is set at $269.99.